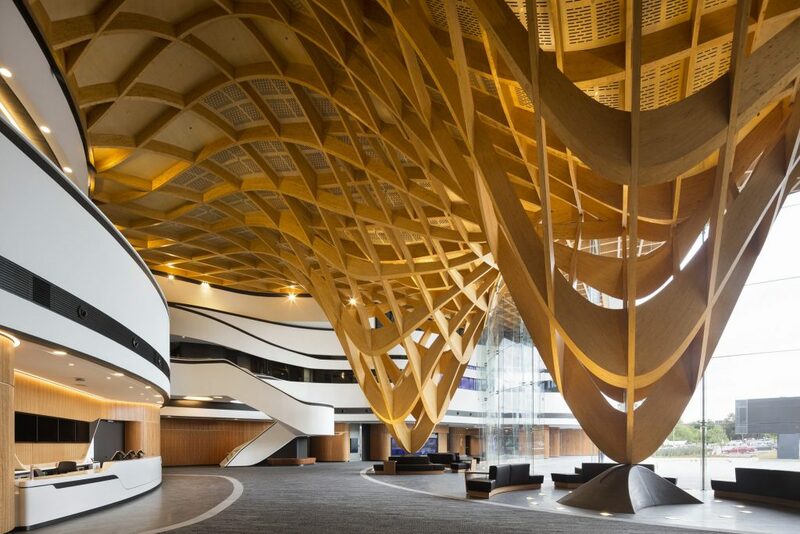 Melbourne’s City of Casey’s spectacular new entertainment precinct, Bunjil Place, added the Grand Prix Award at last month’s Australian Timber Design Awards (ATDA) to its impressive list of achievements. Other winners on included Jackson Teece with the sustainability award, sponsored by Planet Ark, and Tasmania’s Inspiring Place which received the 2018 Dangerous Designs prize for their project Lily Pads. The recipient of international acclaim and extensive editorial coverage, Bunjil Place, was designed by Francis-Jones Morehen Thorp, structural civil and façade engineered by Taylor, Thomson Whiting and built by Multiplex with funding from the City of Casey and the Australian Government. Describing the design process, the architects said they “began to conceive this project as an extended public ground place and a broad sheltering roof, below which we could gather the hybrid uses of the library, theatre, exhibition and also gathering itself. The architecture began to form around the idea of an organic meeting of many paths, literal pathways but also paths of life. This gathering takes place under the protective and sheltering wings of a great roof”. The result is a graceful confluence of forms, the sweeping curves of the roof embrace the spaces beneath, coming to a dramatic focus at the entrance where, depending on one’s point of view, two magnificent pillars, each a jigsaw of interlocking timber members, reach down from the roof to touch the ground or rise to meet the flowing arched structure above it. Aveo Norwest, a ten-storey residential apartment building made of cross laminated timber (CLT) and glulam, received the Planet Ark sponsored sustainability award. Built by Strongbuild, the use of timber is estimated to have reduced the project’s carbon emissions by 2,700 tonnes, compared to a traditional concrete and steel structure. Lily Pads, by Tasmanian firm Inspiring Place received the Dangerous Designs award. Set within the Royal Tasmanian Botanical Gardens, the Lily Pads comprises three circular, overlapping timber-decked platforms that cascade over three levels to reach the surface level of the pond, each platform diminishing in size as it nears the water. “I would like to thank all the entrants for their great work,” said Eileen Newbury, National Program Manager for WoodSolutions and National Marketing and Communications Manager for Forest and Wood Products Australia, the industry services company that resources WoodSolutions, the Platinum sponsor of the event. “It was interesting to see an increase in the number of larger residential and commercial projects, which is a reflection of the growing use of timber building systems in these sectors. It is a trend we expect to continue as more people become aware of the many benefits of timber and more accustomed to designing and building with it,” Ms Newbury concluded. Now in their 19th year, the Awards promote and encourage outstanding timber design. They are open to builders, designers, architects, engineers and landscapers: to anyone involved in the design or building of structures that feature timber. A Rising Star Award is available to students and entrants aged 35 or under.